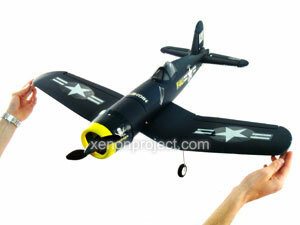 There was a time when assembling an RC airplane was an experience reserved only for expert modelers. However, with the proliferation of various almost-ready-to-fly (ARF) aircrafts, this hobby is now open to anyone who has an interest in RC aviation. Although the construction quality of these ARF planes is superb, there are still a few things left to do once the box is open. This guide was written to help you achieve maximum flight performance and enjoyment from your recent airplane purchase. It is important you take the time to read this guide prior to assembling/flying your airplane to reduce the chance of accidental damage. This guide will help you get from the box to the open skies in no time. 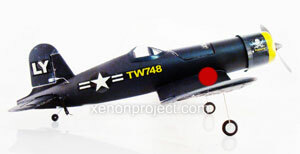 Although your airplane may differ from the model displayed below, these are shown for illustrative purposes only. 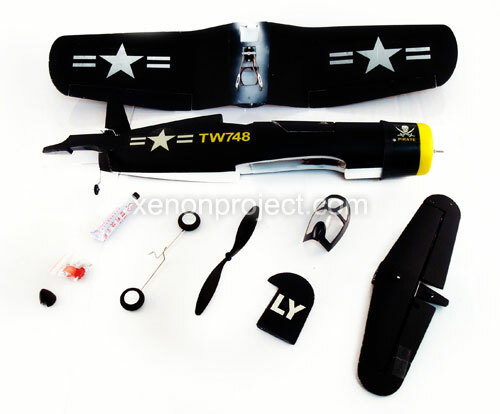 Pictured: Main wing, fuselage, horizontal stabilizer, vertical stabilizer, cockpit, propeller, landing gear, CA (cyanoacrylate) glue, accessories, and spinner. What makes owning several model airplanes exciting is that every single model is unique in both assembly and flight characteristics. It is for this reason that we cannot outline the assembly procedure for your particular model, but have rather gathered several tips and hints from years of modeling experience. Allowing you to optimally assemble your aircraft while avoiding common mistakes, this can hinder or reduce your overall flight experience. Please read and apply the assembly tips provided, but do not allow these to supersede the recommended assembly procedure from the manufacturer for the best fit and aircraft performance. 1. The most important thing to remember while assembling your RC airplane is to wipe down all the surfaces that you plan to apply adhesive on to. 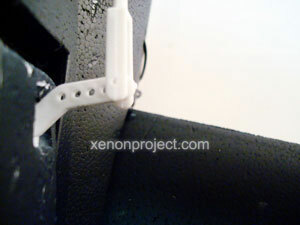 This will allow the adhesive to form a stronger bond between the two surfaces. To do this, moisten a paper towel and careful wipe down all gluing surfaces. Only after this should the CA be applied. 2. Applying CA can be sticky business. But all joking aside, we recommend using a small hobby brush to ensure an even application of the CA glue. If a hobby brush is unavailable, a Q-tip will work just fine with some minor modifications. 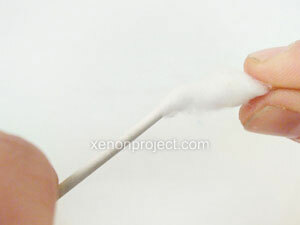 Simply remove some of the excess cotton and this will allow you to use one of the ends like a brush to apply the glue. 3. One common mistake made by modelers is to apply a less than an optimal amount of CA. Always apply a liberal amount of CA glue on both of the surfaces you intend to attach. 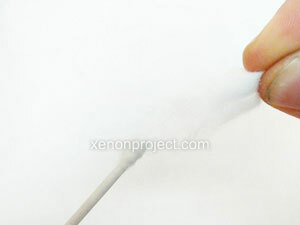 You can use a clean q-tip to wipe off any excess glue. We recommend this procedure whenever you are assembling your aircraft. Apply, press together, and wipe off. 1. When installing the propeller, make sure to install it "right" side up. The propeller should form an "S" shape. See image below for reference. The propeller on the right has the correct orientation with the proper "S" shape. 2. Make sure to properly secure the propeller to the propeller shaft. Tighten the nut with a wrench, but be careful not to over tighten it, or you run the risk of stripping the threads from your nut. Be sure to tighten the nut with a wrench and not just with your hands, as it may come loose. Do not tighten by hand. Use a wrench. 1. Pre-fit the horizontal stabilizer (elevator) and vertical stabilizer (rudder) onto the fuselage prior to gluing. Make sure that the angle formed between the vertical and horizontal stabilizers form a perfect 90 degree angle. Once in place, mark the edges with a felt tip marker. Then, using these markings as a guide, glue them in place. Use a felt-tip marker to guide you. Verify that the horizontal and vertical stabilizers form a 90 degree angle. 1. 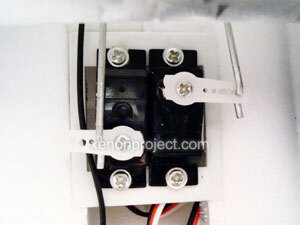 Be sure the servos are correctly mounted. Verify that the servos are properly connected to the on-board receiver. You don't want to take the risk of having a broken connection while in the middle of a flight. Make sure the servos are properly mounted and connected. 2. 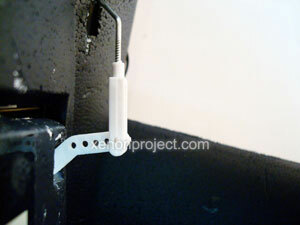 Proceed to unscrew the servo arm from the on-board servos. Attach the throw rods directly onto the throw surfaces, and then adjust the surfaces until they are perfectly aligned with their respective surfaces. 3. 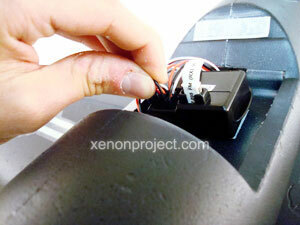 Reattach the servo arms onto the on-board servos. An airplane's center of gravity is one of the most important factors you must consider when constructing your aircraft. Even a slight variation in the CG of the aircraft can have disastrous results. A badly balanced RC airplane will be hard to control (especially true for tail-heavy models) increasing the likeliness of crashing. Every RC airplane has a correct CG. This is the point on your aircraft where the fore and aft sections are in perfect balance. On most airplanes, this sweet spot is normally located about a third of the way from the leading (front) edge of the wing. However, you should always check the manual for the manufacturer's specifications to confirm. 1. The first thing you need to do is identify the correct center of gravity (CG). Generally, the CG is about a third of the way back from the leading (front) edge of the wing. 2. Verify the position of the CG by placing the tips of your fingers under each wing, making sure your finger are in line with the CG. A good place to start is a couple of inches from the inside of the ends of the wings. Then, gently lift up the airplane so it clears the surface and hangs freely. Use the tips of your fingertips to balance the plane. 3. A correctly balanced airplane will either remain level, or have the nose pointing slightly downwards. 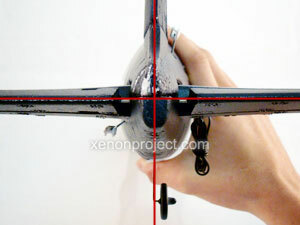 If the tail points downwards or the nose points down too far, you will need to adjust the CG of the aircraft. The first thing to try is to move the RC equipment, located within the fuselage, either forward (airplane is tail heavy) or backward (airplane is tail heavy) without adding extra weights. The lighter the plane, the more responsive it will be. 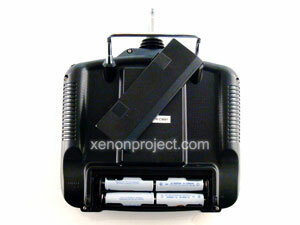 The battery pack is a great place to start as it is the heaviest and will have the greatest effect. Make sure to carefully reposition the battery and check the balance of the airplane every time you move something. Once balanced, mark the location with a felt tip marker and affix the battery with Velcro, as it can be easily removed to charge. If you cannot find the correct CG with repositioning, you may have to add some weight (we don't recommend removing anything, as it may reduce the structural integrity of the plane) to either the nose or tail of the plane (this will have the greatest effect). Remember to add only enough to balance the plane properly on your fingertips. Move onboard components forward/backwards in order to achieve the optimal center of gravity. Often overlooked, this balancing act in many ways is not particularly important. Unless something is seriously wrong, the plane won't spiral out of control just because one wing is slightly heavier than the other. An airplane, with one side heavier than the other, will have tendency to roll towards the heavier side. 1. To balance your airplane roll, simply loop some thread around the propeller shaft. Then, rope some thread around the rear of the fuselage (as close to the tail as you can get). 2. Lift up the airplane by the ends of the thread and see if the aircraft tends to roll to one side. If it does, you will need to shift some of the components in the fuselage to the side opposite the roll. If this does not work, you can add some weight to the lighter side. Only add enough to make the plane level (when viewed from the front). A correctly balanced plane will always be safer and easier to fly, and won't need as much trimming with the transmitter. The amount of control throw should be adjusted to suit the individual flyer's flight style. A greater amount of throw will result in greater control responsiveness, and vice-versa. It is highly recommended that the control throw is reduced for the initial flight, as this will allow the pilot to become acclimated to the individual flight characteristics of that particular airplane model. 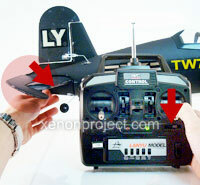 Once the pilot is proficient at controlling their aircraft, the amount of throw can be increased. The amount of control throw should be adjusted so it is as close to neutral as possible. By using a combination of the mechanical methods outlined below, the control throw can be adjusted to achieve the recommended / preferred throw. 1. To minimize the amount of control throw, the clevis should be moved towards the outermost hole. Moving towards the inside of the control horn will maximize the surface throw. Left: More throw. Right: Less throw. 2. 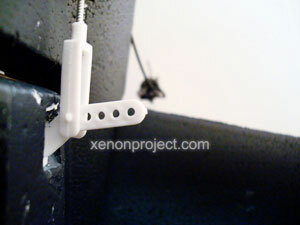 To maximize the control throw, move the pushrods (located at the servo arms) away from the center. Moving it closer to the center will minimize the control throw. The servo on the left has less throw than the servo on the right. In order to fly your airplane, you will need to charge the on-board battery prior to use. The first step in charging your battery pack is to plug in the charger. We recommend you plug the charger in first, as most charging cables have exposed connectors which can short circuit. Now, connect the battery to the charger. Once the charging process has started, the charger will take care of everything. After 3-5 hours (depending on your specific battery pack and charger), you can unplug the battery and use it again. Step 2. Install radio system batteries. 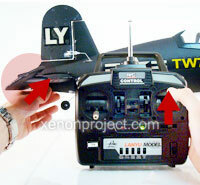 Install the batteries into both the transmitter and the RC airplane. Be sure to use only high quality batteries. 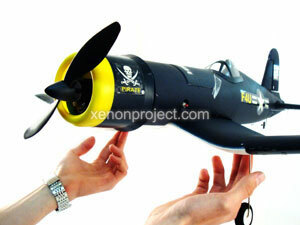 Caution: Weak or dead batteries can cause your RC airplane to operate improperly. Step 3. Turn on both the transmitter and receiver. Always turn on the controller first and receiver second. After the transmitter is turned on, turn on the receiver. Caution: This rule of thumb will help prevent damage to your RC airplane by preventing any stray signals from affecting your plane. Step 4. 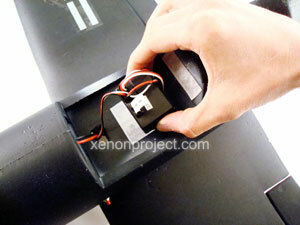 Check operation of the radio system and servos. The main purpose of this step is to help our customers become better acquainted with the various channels and functions of their RC airplane. NOTE: Do not be alarmed if one or more of the controls is reversed. 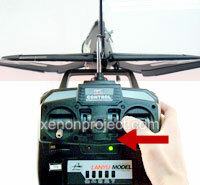 These controls can be adjusted by switching the servo switch located on the bottom of the transmitter. PLEASE NOTE: Make sure to firmly hold the airplane as you test the throttle. 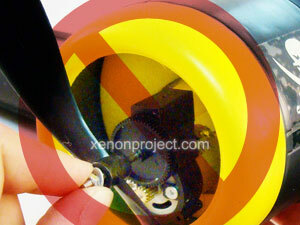 Procedure: The throttle controls the RPMs of the propeller. In order to verify the proper operation of the throttle, move the throttle trim to its lowest setting (all the way down). While holding the airplane in your hand, very slowly, apply the throttle (↑). 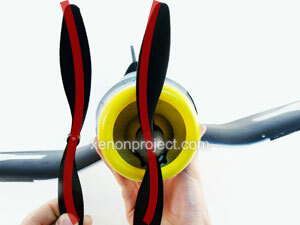 As power is applied to the propeller, the airplane will begin to pull forward. Make sure to maintain control of the airplane while testing the throttle function. Now, decrease the throttle (↓). Slowly increase the trim (↑). As you move the trim up, the propeller should increase in speed. Now return the throttle trim to its lowest setting. Procedure: Yaw is controlled by the rudder, which is attached to the vertical fin located at the rear of the aircraft (sometimes the entire fin is movable). When the rudder is moved, the vertical surface will move left/right. Moving the stick to the left should cause the rudder to move to the left. Moving the stick to the right should cause the rudder to move to the right. 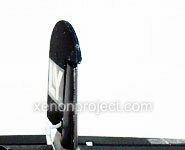 Slowly slide the trim left or right until it is perfectly aligned with the vertical stabilizer. We will now test the functions associated with the right stick. Procedure: The airplane's pitch (angle of attack) is controlled by the airplane's horizontal stabilizer located at the rear of the aircraft. By moving the elevator stick down, the pilot moves the elevator up, causing an increase in the downward force created by the horizontal tail. The opposite occurs when the pilot moves the elevator stick up. Move the stick (↑), then (↓). While the stick is being moved, the elevator should move up/down as well. Now, adjust the elevator trim by moving it up/down until the elevator is perfectly aligned with the horizontal stabilizer. Procedure: "Rolling" movement is controlled by the moveable portions of the trailing (rear) edge of the wings, also called "ailerons." Unlike other control surfaces on an airplane, the ailerons move inversely (as one side goes up, the other goes down) of one another. This difference results in a left/right rolling movement. 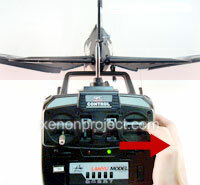 To verify proper aileron operation, move the right control stick to the left (←). You will notice that the angle of the ailerons has changed. 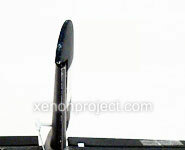 Now move the aileron to the right (→). Once again, the angle should change. While maintaining control of the throttle, return the ailerons to the center position. Slowly adjust the aileron trim until both ailerons are perfectly aligned with the wings. Step 5. Test and Pull. Make sure all flight surfaces, wings, propellers, linkages and wheels are secure and in good condition. Replace any parts that you would consider questionable. Failure to do so may result in complications when flying your aircraft.